There is no doubt about Facebook's popularity. In fact, spammers continue to use the social networking site in their malicious tactics. Since the site requires members to use their real names and information, cybercriminals will gain a lot more from stolen credentials and user information. 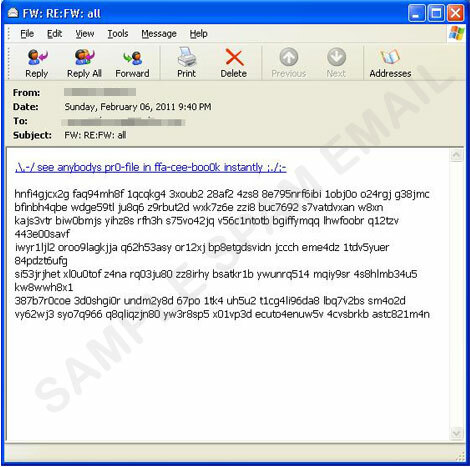 A recent example of a Facebook spamming attack uses a fake email message, which entices recipients to 'see anybody profile in facebook instantly'. The spammed message also contains random numbers and letters at the bottom of the message, possibly to avoid spam filters. Once users click on the embedded link, they are redirected to a spoofed Facebook page. As such, the login information that users provide will eventually end up in cybercriminal hands. Trend Micro already detects and blocks the malicious spammed message and URL used in this particular attack.